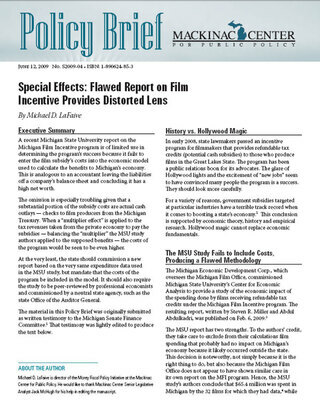 1 Michael D. LaFaive, "Special Effects: Flawed Report on Film Incentive Provides Distorted Lens," Mackinac Center for Public Policy, http://www.mackinac.org/10477 (accessed June 9, 2009). 2 See, for instance, Michael D. LaFaive, "MEGA: A Retrospective Assessment," (Mackinac Center for Public Policy, 2005), http://www.mackinac.org/archives/2005/s2005-02.pdf, (accessed June 10, 2009). 3 Steven R. Miller and Abdul Abdulkadri, "The Economic Impact of Michigan's Motion Picture Production Industry and the Michigan Motion Picture Production Credit," (Michigan State University Center for Economic Analysis, 2009), http://www.michigan.gov/documents/filmoffice/MSU_Economic_Impact_Study_269263_7.pdf, (accessed May 22, 2009). 5 "Michigan Film Office 2008 Annual Report: Film Industry Refundable Tax Credit Operation and Effectiveness," (Michigan Film Office, 2009), 4, http://www.michigan.gov/documents/filmoffice/MFO_2008_Annual_ Report_269261_7.pdf, (accessed June 10, 2009). 6 Kathy Hoekstra, "The Scene and the Unseen: Act III," Mackinac for Center for Public Policy," http://www.mackinac.org/10388 (accessed June 14, 2009). 8 Miller and Abdulkadri, "The Economic Impact of Michigan's Motion Picture Production Industry and the Michigan Motion Picture Production Credit," 7. 12 "MSU Study Finds Film Industry Big Hit in Michigan," Michigan State University, http://news.msu.edu/story/6082/ (accessed June 10, 2009). 13 "Michigan Film Office 2008 Annual Report: Film Industry Refundable Tax Credit Operation and Effectiveness," 4. 14 David Zin, Michigan Senate Fiscal Agency, e-mail to Michael D. LaFaive, April 29, 2009. 15 "MSU Study Finds Film Industry Big Hit in Michigan." 16 Miller and Abdulkadri, "The Economic Impact of Michigan's Motion Picture Production Industry and the Michigan Motion Picture Production Credit," 4. 17 Edwin S. Mills, "The Misuse of Regional Economic Models," Cato Journal, Vol. 13, No. 1 Spring/Summer, (1993), 38, http://www.mackinac.org/archives/2009/nr043009-REMI-misuse.pdf. 18 Patrick Anderson, Business, Economics, and Finance with MATLAB, GIS, and Simulation Models (Boca Raton: Chapman & Hall/CRC Press LLC, 2005), 129. 19 John L. Crompton, Journal of Travel Research Vol. 45, No. 1 (2006): 67. 20 Trace Graham, Michigan Economic Development Corporation Freedom of Information Act Coordinator, mailing to James Hohman, Mackinac Center, April 6, 2009.
Business Monthly, September 2008, http://www.lansingbusiness monthly.com/article_read.asp?articleID=4716 (accessed June 10, 2009). 22 Alan Peters and Peter Fisher, "The Failures of Economic Development Incentives," Journal of the American Planning Association Vol. 70, No. 1 (2004): 32. 24 Kathy Hoekstra and Patrick J. Wright, "News Release: Film Office Report Violates Michigan Law and the Spirit of Sunshine Week," Mackinac Center for Public Policy, http://www.mackinac.org/10391 (accessed June 10, 2009). 25 Patrick J. Wright, "News Release: State Attorney General Agrees That Michigan Film Office Violated State Law by Failing to Disclose Required Film Spending Information," Mackinac Center for Public Policy, http://www.mackinac.org/10485 (accessed June 14, 2009).